Does your granny smell like cabbage? Does she like to play boring games like Scrabble? Do you think she’s boring? If you’ve answered yes to all of these questions you probably don’t know her that well. For all you know she could be a spy, a superhero or even an international jewel thief like Ben’s granny. Every Friday night Ben gets sent to stay with his granny, while his parents go out to the movies or to watch Strictly Stars Dancing Live. Ben thinks she’s boring and would rather be anywhere else than spending time with her. Ben gets sick of eating his granny’s cabbage soup and decides to look in her cupboard for some real food. He never thought he would discover the stash of priceless jewels in her biscuit tin. When he confronts her to find out the truth, he discovers that his granny isn’t boring, she’s an international jewel thief. Ben decides to help his granny pull off the crime of the century – break into the Tower of London and steal the crown jewels. 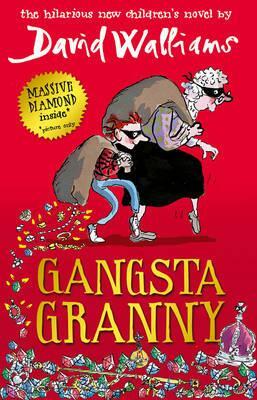 Gangsta Granny is a book that’s both really funny and a bit sad. I’m sure your granny’s just a bit like Ben’s granny, even if she’s not a jewel thief. If you ask her I’m sure some of her stories are just as interesting. Ben’s parents seem like they don’t really care about him because they’re more interested in their dancing show than they are in him, but deep down they love him. I love the way David Walliams writes because his stories are so different and his characters are really easy to relate too. If you liked his other stories, like The Boy in the Dress, Mr Stink and Billionaire Boy, or you like Roald Dahl’s books, you’ll love Gangsta Granny. That’s the best thing about good children’s books, I think – they show how extraordinary the every day is. I’ve just finished reading Diana Wynne Jones’ ‘Howl’s Magic Castle’. At one point the magical characters in that stumble through into the ‘real’ world (Wales) and it looks bizarre and fantastic to them.